Recently back from WWI and suffering from Post Traumatic Stress Disorder, Alan Milne (Domhnall Gleeson), a once celebrated WestEnd playwright, finds himself suffering from writer’s block and uninspired by a city he has grown tired of. After the arrival of his first born Christopher Robin, a boy who he and his wife Daphne (Margot Robbie) instantly abandoned into the care of dutiful nanny Olive, played brillianntly Kelly Macdonald, Alan moves the family to the Sussex countryside in the hope of writing again. Despite Daphne’s constant badgering, Milne announces that he plans to write an anti-war novel, a novel which in the end never really materialises. Left alone with Christopher, after an argument with Daphne, Milne finds himself transported into his own child’s imaginary world of forest animals and toys which eventually prompts him to write the story of Pooh and all his friends with the help of young Christopher. Curtis does a fantastic job in transporting his audience into a complex imaginary world of magical enchanted forests and childhood innocence. By bringing these much loved childhood favourites to the screen, the director even succeeds in allowing those of us who have loved Pooh et al, to relive our early years. Gleeson’s cut glass English, although not always perfect, shows just how impressive the actor’s range has become. However, Robbie sadly fails to convince as Daphne with her inconsistent delivery and at times rather jarring accent. Will Tilston as young Christopher has to certainly qualify for one of the most accomplished child actors of our time with his beautifully knowing delivery. 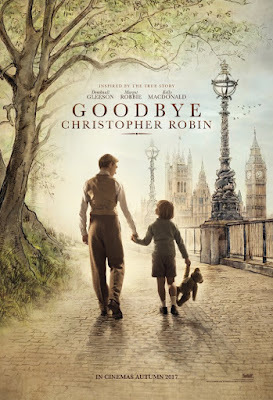 On the whole, a wonderful film which will having you sobbing your heart out by the closing titles, but only if you allow yourself to go with the sentimentality attached to its subject matter. Not perfect by any means, but definitely worth catching for its heartwarming premise alone.